In my last post, I wrote about the different types of daddy/adult baby experiences. One of them, the ‘huggy’ experience is all about comfort, care and babying. 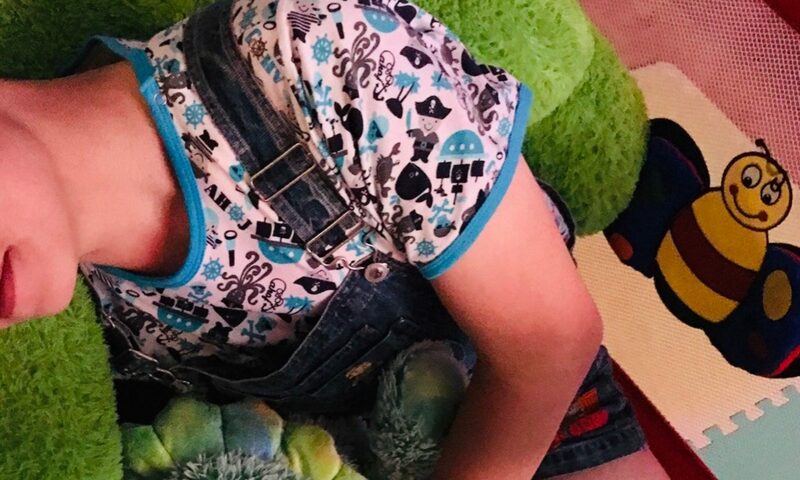 Now, I don’t want to leave all you toddlers and little kids out there stranded, so I’ll write more soon about experiences that include more play, adventures, and maybe even (gasp) training pants. In the meantime I spent a lot of this week running back and forth to the post office to pick up parcels. Stuff that I ordered months ago seemed to arrive at the same time as things I ordered week back. I decided to pick out a few of the things that I got in the mail this week and share them with you. I’ve chosen the stuff that feels more “huggy-like” as a way of following up on my last post. Now, the first thing I should say is that while I don’t have a commercial relationship with anyone, I’m not above saying that something is, well, awesome. And for the price, Privatina had better be I suppose! Most of the following items come from the European company and are shipped from Poland. Although the boxes seem to have a tendency to get crushed, the clothing inside is really well packaged and comes in heat sealed plastic and was in perfect shape. The materials are all soft and snuggly. The stitching is incredible. And the fact that they use materials that generally match makes creating outfits easy. That made it easy to imagine selecting the following outfits for baby’s huggly weekend. 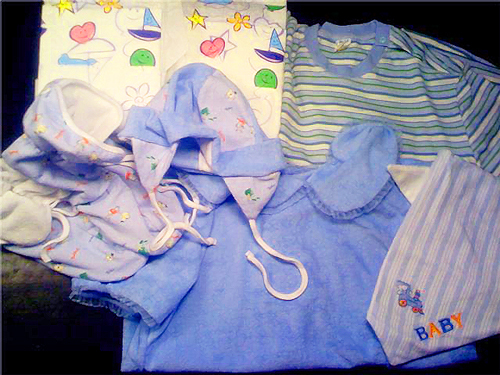 Diapers and Covers and Footies Oh My! First up of course are the diapers. In this case ABU Cushies, the new ‘babyish brand’. Now, I’m hardly the ideal person to evaluate them, but for a daddy I think they’re cute – the single tape is reminiscent of older style diapers and the cute patterns are certainly babyish. They also have a lovely baby scent to them and I imagine would fit so that they come almost up to the belly button which gives dad a great feeling that his little one is snug and protected. They don’t quite have the reassuring crinkle that I like but it’s noticeable enough. 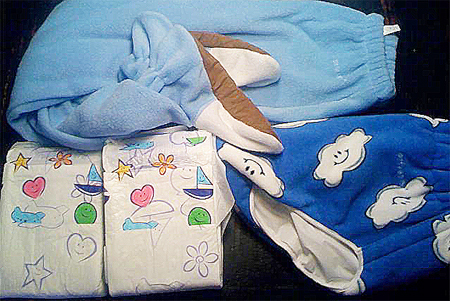 With the diapers, a new diaper cover in blue with cloud patterns. This would be ideal over a little guy’s diaper at the beginning of a weekend when he’s still in play mode. They have a really wonderful plastic lining which make a wonderful crinkle sound. With just a t-shirt, the little one can happily play with daddy or in his playpen and look as cute as a button. For later in the evening a pair of footed bottoms. I couldn’t help thinking how wonderful these are – snuggly feet in a soft sleeper pattern but also suitable with just a onesie or t-shirt. Now, no preparation would be complete without making sure the diaper supplies are ready. More diapers, of course. (I also received the ABU Dino diapers, but they’re better for toddlers). 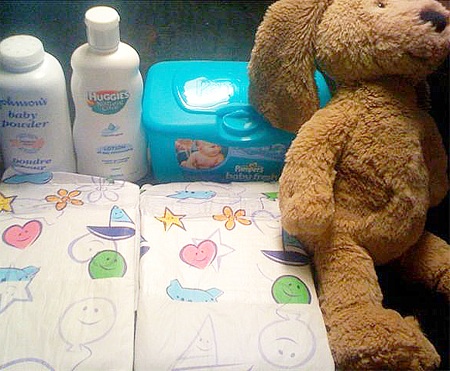 And my favorites: Pamper’s wipes, Huggie’s lotion and baby powder. Each of them are, well, smell sensations. Used on a little guy, he’d smell like a baby from head-to-toe. A few options for shirts and cuddle time. The striped shirt is perfect for the playpen or high chair. The baby blue shirt with the soft collar and the snaps at the back makes me feel like warming a bottle of milk and cradling a little guy in my arms. Which, of course, is why a daddy is there in the first place. Have a great weekend and may you be well dressed, well diapered, and may your daddy take very special care of you. same here. and good text. It’s all pretty awesome. I dunno where I’m going to start storing it all! HAHAHA. I’m used to disposable diapers, having worn them for most of my life. But I’m more than interested in cloth diapers. I love onesies, rompers and shortalls. I’m a fairly big baby, so I’d need big diapers and plastic pants.